Southern California is well known for its sunny and warm weather. It offers very pleasant temperatures throughout the year. It rarely gets too cold or too hot, at least along the coast. The combination of constant and stable ocean water temperature of the Pacific and the geographic latitude play a crucial role in the Southern California’s climate formation. During most of the year the weather in most parts of Southern California is dry and sunny. Heavy rainfalls are possible only during the winter months. The climate in the deep South of California is subtropical Mediterranean and is very attractive and favourable for tourism and living. Summer is the longest season of the year, winter is quite short and brings quite mild weather, spring and autumn are short and not very distinguished. A number of places in Europe have nearly the same climate as this in the deep South of California, although every single place has its own specific features. One of the most notable differences is the gap between the average summer temperatures. For example, while the Pacific maintains the average summer temperature in Southern California more pleasant and enjoyable thanks to the cold California Current, Southern Europe is strongly influenced by the warmer Mediterranean Sea and the Sahara desert. Therefore summers in Southern Europe bring higher temperatures in comparison with Southern California. The ocean water temperature in La Jolla, California is highest in August and September. Therefore in Southern California August and September are the months with the highest daytime temperatures. In Southern Europe is different. The Mediterranean is warmest in July and August, ie around a month earlier, so the average air temperature is also at its maximum at this time of the year. The warmest days in Southern California occur later in the summer season compared to the warmest days in Southern Europe. Furthermore, the temperature of the ocean in Southern California does not allow the summer temperature to become too high. For example, in August and September the ocean water along the coast of La Jolla, California is about 22°C. For this reason, the air temperature during the day is relatively low for these latitudes and reaches only about 25°C in August in La Jolla and the entire coastal area of San Diego. In August the water temperature near the city of Taormina in Sicily, Italy reaches about 28 – 29°C. For this reason, the air temperature is significantly higher – about 29°C on average. Costa del Sol is located on the Mediterranean Sea, on the southern coast of Spain. The coastline is dotted with some of the most famous Spanish resorts such as Marbella, Malaga and Torremolinos. The average daytime winter temperature is about 17°C in January, 18°C in February and around 20°C in March. The weather conditions are not very different from what you can find in cities such as San Diego in USA, where the temperature during the period is approximately 18 – 19°C on average. Just like in Southern California, the winter months on the southern coast of Spain bring plenty of sunshine and mostly dry weather. The same applies for summers, which in southern Spain are even warmer in comparison with San Diego. Costa de la Luz is this part of the coast of Andalusia, which stretches west of Cape Tarifa and Gibraltar, on the Atlantic coast. This part of Spain is even more similar to the extreme south of California. Winters bring in the area temperatures of between 16 and 19°C. Summers are fresher and for this reason more pleasant than those in the Costa del Sol. The average temperature is usually around 28°C. Similar to Southern California, cool ocean currents run along the coast of Costa de la Luz. The ocean water temperature does not differ from that in La Jolla, California and is about 16°C in winter and about 22°C in summer. Many people say that nowhere in Europe has such a warm climate as in Southern California. But what about the island of Cyprus, which is located in the eastern part of the Mediterranean? This is an amazing place with temperatures in January of about 18°C during the day. The average annual temperature during the day is 20.9°C in the beautiful and sunny city of San Diego and the impressive 25,4°C in the noisy and colourful tourist center of Limassol on the island of Cyprus. It is important to note that the winter months are exactly the same with temperatures between 17 and 20°C. Summers in Cyprus, however, are warmer than in San Diego. The Greek island of Crete is world famous for its incredible cuisine but also for its wonderful weather. The island’s climate conditions are very similar to the deep South of California. The subtropical vegetation (olive groves, cypress trees, citrus trees, palm trees) clearly talks about that. The temperature of around 16 – 17°C in January is comparable to the pleasant 18°C in San Diego, but on the other hand, summers in Crete are warmer. Rhodes is one of the sunniest Mediterranean islands and sometimes even a bit warmer than Crete, so it is not surprising to see this jewel in the list. The winter here is very mild and pleasant, with temperatures of around 16 – 17°C during the day. The average night temperature in January is around 9°C and is nearly the same like the night time temperature in Southern California during the winter season. The island enjoys 8 months with average daytime temperatures of over 20°C. July and August are very hot with temperatures of over 30°C. Ibiza is a beautiful destination with snow white sandy beaches and typical Mediterranean climate that extremely resembles the weather in Southern California. The temperature in January and February is about 16°C, ie about 2 degrees lower than in San Diego. However, the spring months are sunnier and with lesser chance of foggy weather. Summers in Ibiza last from early May to late October, but very warm and sunny days with temperatures of over 20 degrees and acceptable conditions for the beach are sometimes possible even in April and November. The winter season is quite sunny in Ibiza, and southern winds can easily increase the temperature up to the pleasant 20°C. The average annual daytime temperature is about 0.3°C higher than in San Diego. From April till November the average daytime temperature is over 20°C. 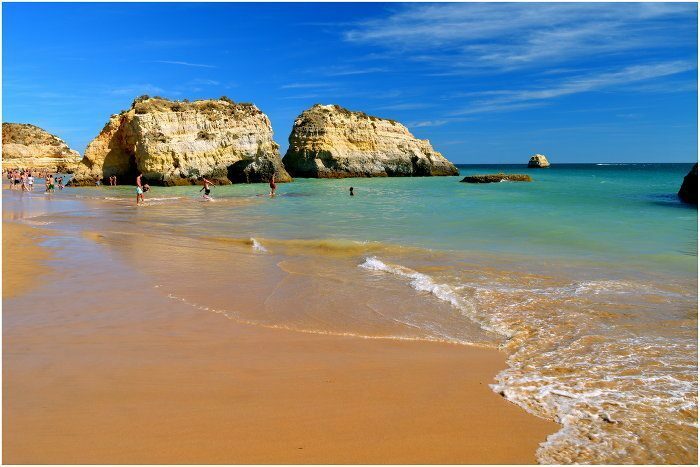 During the period from December to March, Algarve enjoys a mild weather with temperatures between 16 and 19°C with some rare exceptions. In January, the ocean surface temperature along the coasts of Algarve and San Diego is exactly the same or about 16°C. In summer, the average ocean water temperature is about 3 degrees higher in comparison with Southern California, reaching approximately 25°C. The weather in Mallorca is usually very nice (with some small exceptions) and is very similar to the deep South of California. Summers are very long and warm, but the Mediterranean Sea maintains the average daytime temperature very pleasant, usually below 30°C. Generally, from May to October the weather in Mallorca is warm and from November to March-April is cool, although the difference between summer and winter temperatures is negligible. Winter temperatures in Mallorca fall to 15°C in January and 16°C in February, which is comparable to the average temperature during the day in San Diego, which is about 18°C. The Canary Islands are located more than 2000 km south west of Madrid, the capital of Spain, and only around 100 km off the coast of Morocco. For this reason they enjoy a warmer climate than any place in California. Actually, the Canary Islands have a dry tropical climate, and although in terms of rainfall the climate of the archipelago is very similar to Southern California, in terms of temperatures the Canary Islands are rather similar to the warmer and sunnier state of Florida.